One project on our Congestion Free Network that appears to have caught the attention of a few people has been what we call the Mt Roskill Spur. We’ve been getting some queries about it like what it is, why have it on the CFN and how much does it cost. The purpose of this post is to hopefully answer those questions. You can see it on the map below. This is the easiest of the questions to answer. It’s a short railway line that comes off the Western line between the Mt Albert and Avondale stations and ends at Mt Roskill. It would have two stations, one at Owairaka and one at Mt Roskill. Why have it on the CFN? Before I answer this question let’s take a quick history lesson. Back in the 1940’s after World War 2 Auckland was starting to develop quite quickly and this was a time well before we started building our first motorway. At the time a huge amount of freight was being moved around the country by rail and that was only expected to increase. Likewise with the city growing it was realised by the railways that there was a strong possibility that there would be increases in passenger trains within the region (early incarnations of the CRL had been talked about since the 1920’s). It was realised that the growth, would put a lot of pressure on the Newmarket junction. In addition the tracks on the inner sections of both the western and southern lines are quite steep which is not ideal for hauling heavy freight trains up in a hurry. They realised that to get freight trains destined or arriving from north across the city it would be increasingly difficult and so in the late 1940’s designated a route known as the Avondale-Southdown line. The intention was to enable trains to bypass Newmarket by cutting across the lower section of the isthmus. The designation for the line is in blue on the map below but of course was never built. You can also quite clearly see some elements of the designation in the councils GIS maps. One of the best examples is at the Avondale end where the land for the junction with the western line is clearly visible by looking at the property boundaries. 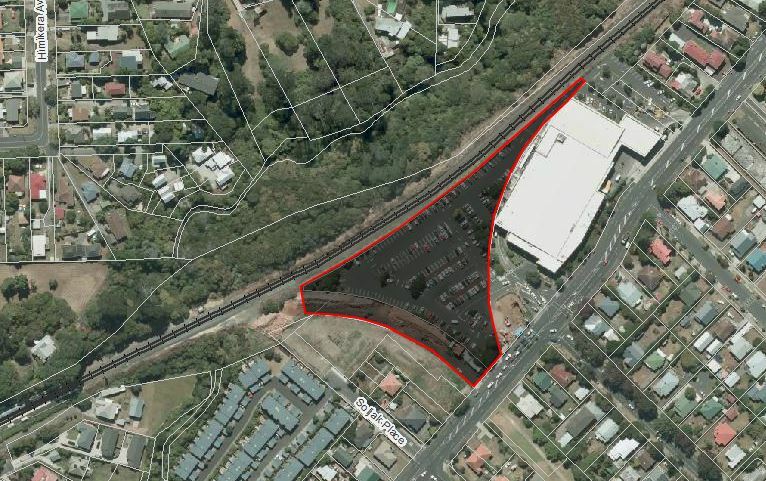 I have highlighted in the image below and just in case you’re not completely familiar with it, the building with the large roof is the Pak n Save on New North Rd. Building the line has appeared on a quite a number of documents over the years and most recently has included the Auckland Plan and as such has been included in the Integrated Transport Programme however it is considered a third decade project i.e. sometime between 2031 and 2041. The plans do list it as being on the future Rapid Transit Network meaning it is intended to eventually carry passengers however I’ll come back to that point shortly. Of course the line is yet to be built however within the last decade the NZTA and its predecessors have been busy “completing the motorway network” and SH20 has been extended from Hillsborough through to Maioro St with the Waterview Connection project being the piece that will like SH20 with SH16. Because the rail designation already existed it made sense for the road builders to future proof what they were doing – which was probably helped along by the fact they needed to use some of the rail designation. The short version is that as such the bridges that cross the motorway through this part have also been designed with the rail line in mind and in almost all cases the extra span is already in place just waiting for a rail line to be installed underneath it. This is perhaps most clear at Maioro St (below) where you can see the spans for the motorway between the on/off ramps while there is a completely separate span for the future rail line. Because the most of the motorway bridges have already been built it means that there is much less to do if we do ever decide to build the line. That should save a heap of money and time in the long run which is always a good thing. 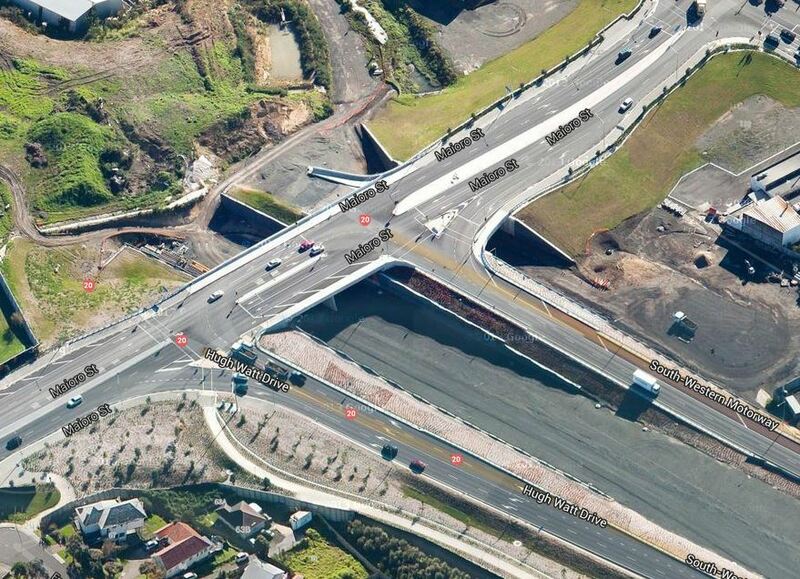 There are two bridges which have not yet been built, one is Richardson Rd while the other is Dominion Rd. Adding the already completed bridges to that the fact that Kiwirail already own most of the corridor and it means that it should bring down the cost of building the line substantially although admittedly I’m no engineer. The Road crossings that would need to be addressed to enable a train service like we proposed would be New North Rd and Richardson Rd. Well if you look at the second image you can see that to get back to down to sea level from Hillsborough the rail line curves and weaves through the suburbs to the north of Onehunga, well away from the existing rail network. Further while the line is designated and Kiwirail own many if not all of the properties needed, I personally can’t see the residents of these houses being all keen on a rail line going in nearby and I can see them fighting any construction regardless. Other plans have suggested that the route down to Onehunga might follow SH20 all the way however getting down from Hillsborough is extremely steep dropping by about 60m over 1.5km which would probably be far too much for trains to handle. Further designing and designating a new route down to Onehunga is likely to take an extremely long time and cost a lot of money. So the question we asked is whether there is anything we can do to make use of at least parts of the existing designation without having to wait for the whole thing to be completed. The Mt Roskill Spur was the answer. There’s no point in building something just for the sake of it and so the next question is if there is any logic in building this line. We think there is. There are a number of different options for how we run trains after the CRL has been completed and one of the options is a three line system where each of the long lines (West from Swanson, South from Papakura, East from Manukau) are paired up with a short run elsewhere on the network. One of the key reasons for this is that joining long lines together (say west and south) makes for a very long route which can suffer from reliability problems as delays can be amplified along the route. The long and short pairing helps address that somewhat while also being useful in providing additional services on the inner sections of each of the lines which is where the most passenger demand is going to be. The Onehunga line already serves this function on the southern line. This extra capacity is likely to be especially important on the inner western line which would suddenly become much closer to the CBD following the completion of the CRL and likely to see a significant boost in patronage. So it effectively helps to balance out the rail network while also providing additional capacity on the existing lines. You can see that AT has been thinking about exactly this from this image on their CRL page which shows the rail network as a three track system. We’re suggesting sending either the red or green route to Mt Roskill. The second and most obvious benefit is that it would provide two new stations on the network in what are fairly residential areas and the land surrounding the proposed Owairaka station (which would be between Richardson Rd and Maioro St) has zoned to allow for a town centre and the surrounding area has a decent amount of Terraced House and Apartment zoning in the Unitary Plan. It is one of the higher density zoned places in the old Auckland City area (should have been a lot more). There are also some potentially large benefits to buses. We already know that the Dominion Rd buses can get very busy at peak times and it is one of the most popular routes in the city. These routes are only like to get busier in the future as PT becomes more useful overall. Yet at the same time we know from the City Centre Future Access Study that space within the CBD is going to be extremely constrained due to the number of buses from other areas. That is after-all one of the key reasons for needing the CRL. This spur helps to improve that situation as the two stations are passed by three different Frequent bus routes (two on Dominion Rd and one on Sandringham Rd). While the rail network goes in the “wrong direction” for a little bit, it will likely be slightly faster from Dominion Rd through to the centre of the CBD so that gives bus passengers the option of a quick transfer to the rail network for a faster journey. Not all will do that but it is likely some will and combined with the patronage from those living in the vicinity of the stations are likely to reduce the pressure on buses, especially on Dominion Rd meaning more space on them for people closer to town. Some have asked why not extend the line all the way Hayr Rd which also carries a frequent bus route. That could be done perhaps a bit later however by my calculations the rail network isn’t as competitive from a time perspective and there would be the added cost to get the line under Dominion Rd. The map below shows the proposed frequent routes in the area. So hopefully I’ve managed to explain why it is potentially such a useful but of course the cost is the big question. This is the area where we have had to speculate the most however here are some estimates. Railway Junction – The Newmarket junction was recently upgraded at a cost of about $50 million however that is much more complex that what is needed here. We’ve estimated $25 million. New North Rd – This would have to be grade separated so once again we have allowed $25 million for this. Richardson Rd – While the rail span hasn’t been built yet, it has been designed for so can probably can be done for $10 million or less. Stations – We don’t envisage the two stations needing to be major ones like say New Lynn or Newmarket but a typical suburban station instead so probably $5m each so $10 million combined. Tracks – Because the corridor already exists and has been grade separated we expect that the tracks should be able to be laid much cheaper (per km) than other projects. The complete rebuild of the Onehunga branch was in the vicinity of $10 million while the new Manukau branch cost $50 including the station in a trench. As such we think it should cost ~$80 million. All up that gives us a cost of about $150 million. I think the rail spur proposed above would be a very useful addition to our network after the CRL is constructed. Not only would it be fairly quick and easy to construct, it would also offer a speed advantage over catching the bus (and probably driving) for those currently living in the southern part of the Auckland isthmus and it would help ease pressure on the need for us to keep adding more and more bus services, by shifting those trips to rail. It would also be likely to significantly ease congestion along both Sandringham and Dominion Roads if the service was attractive enough. A pretty useful “low hanging fruit” I think. A great idea. That area is a PT wasteland at the moment. Would add massive value to property in the area. I wouldn’t really call it a PT wasteland. There are pretty frequent buses running through to dominion/sandringham rd. What happened to the CRL plans to build a big turn back station between Mount Eden and Kingsland? Couldn’t the money for that be put towards this and it done at the same time as CRL? Also, you must lobby hard to make sure that Mount Roskill station is built so it can become a through station in the future and we don’t end up with another Manukau terminus that can’t be extended. The problem with that is there wasn’t, and isn’t, any actual money or budget allocation for the CRL yet. There is no money saved to be spent elsewhere because it wasn’t funded in the first place. If anything they’ll just have to try and make it cheaper, so any project like this will have to stack up on it’s own. If the weren’t going to build an eastern link at the junction as Ben says all 3 lines from the CRL would need to be turned around somewhere on the western line. Sending more than two past Kingsland would have been quite a waste of money so the proposed interchange station would have been needed with or without this spur (trains could have been turned around easily at at lots of places on the western lines anyway). Does anyone know if there are any plans for the mostly abandoned warehouses between May and Roma roads (some of the purple colour on the map above)? 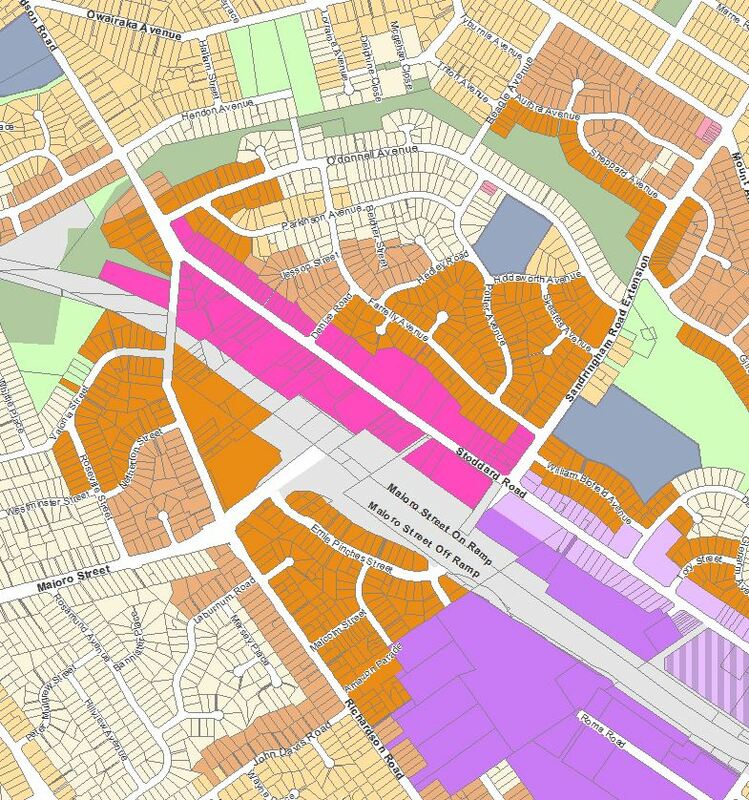 I noticed on an Auckland plan a few years back they were marked as an ‘area of interest’ or something like that. If the spur was done, this land would be very close to the trains and would be great for commercial or residential development, or maybe say a business park. As far as I am aware this land is currently owned by the Hay family directly or by the Keith Hay Construction Company. It is badly neglected and a blot on the landscape of the area. Construction of the Roskill Line would greatly enhance its value and hopefully encourage development. My assumption has always been that it will be developed when waterview is completed, that should seriously increase its value. I’m hoping for high rise apartments with a bit of commercial too. “Low hanging fruit” indeed. Given what successive governments have plowed into roading projects it would be a bargain at $150M. Thanks for the excellent write up! I wonder if the Mt Roskill station would be better off closer to May road where the New World and shopping centre are, or maybe even halfway between Dominion and May roads? It needs to be able to interact with the Dominion Rd buses but certainly could and should have walking connections to May Rd. The distance between May and Dominion Rd extn is very short so a station there could easily have access from both roads similar to the Te Papapa Station that has walkways from both May Rd and Captain Springs Rd. As far as patronage is concerned when I led the campaign to re-open the Onehunga Line opponents then said there wouldn’t be enough demand. Well that got proved wrong. If one looks at the residential catchment area for this proposed line it is considerably larger than the Onehunga Line. We also know well that where new PT options become available provided the are managed correctly the uptake far exceeds predicted demand. The Northern Busway is a classic example. The only failure was the trains that ran to Helensville and in hindsight that was deemed to fail right from the start. Thanks Jimbo from the point of being able to actively work from within to promote PT it was a pity I didn’t get more. That’s the way of politics but it wont stop me working on behalf of the residents of Puketapapa particularly when it comes to heritage and PT issues. If AT built the spur now, I wonder if it would create enough patronage to force the govt to build the CRL? No, as there are only so many trains that can go into Britomart so trains down here would have to displace trains further out on the Western line or in the south, therefore if it were built before the CRL it would likely decrease patronage considering it is a shorter line. You could probably run it at two trains an hour, keeping the main western line at four. Not sure if two trains an hour going the long way via Newmarket would be especially good however. As I understand it Britomart isn’t at capacity yet. If it were at capacity the trains were always full and no more could be added, there would be a lot of public pressure on the govt to start the CRL early! That is only because we don’t have enough trains. If we had more available then the western line would have been bumped up to 6tph sooner taking up that capacity. That will happen with electrification. Well even if the CRL was kept to it’s current timeline what you describe is expected to be the situation by the time it opens. I don’t see how having a third of the western line trains running well short of the end of the line to service a two station branch would help grow patronage any faster. The trains on this line don’t necessarily have to go to Britomart. I like the suggestion it could be the end point perhaps for the Onehunga Line. It is time that rail users started to get used to transferring like they do in other major cities of the world. As long as you get off one train and only have a few minutes to transfer to the next one this shouldn’t be a problem. I did it frequently when I was in London or New York and even Sydney.. I think if they went to Panmure it would create a great line. I used to catch a bus from Panmure to Ellerslie which would slowly weave it’s way through traffic to Ellerslie. It was so slow that I ended up driving again. I would have taken a train but I needed to hop off at Otahuhu or something like that in order to get to Ellerslie. A service like this would be awesome. I seem to remember a proposed scheme where this spur could be opened earlier with trains running Dominion Road to Onehunga via Newmarket. No issue with the Britomart bottle neck; it could actually free up capacity with the Onehunga trains no longer going into Britomart. There would be some inconvenience as passengers would have to change at Newmarket for Britomart/Parnell journeys but this could be minimised with easy transfers and more trains once the electric train are all go. would be no point to this line without CRL. An infrequent and indirect service would result, which would attract only a few from buses. From Mt Roskill is about same distance Britomart as New Lynn so this gives us good idea of journey times. Train takes 33minutes from New Lynn to Britomart now, maybe down to 30 with electrics. But with CRL journey time 23 minutes from New Lynn to Aotea, so that is the real advantage of this line. Note the CRL gives ability to have high frequency, more direct services, and big CBD catchment increase. All of this comes together to make the Roskill Rail Line a success despite already very good PT services. I remain unconvinced that the Mt Roskill station will be as heavily used as you might think. Firstly the buses are pretty quick already especially in the evening peak where you can get to Mt Roskill in about 20 minutes from downtown which is just as quick if not quicker than the train would hypothetically take. It is admittedly a bit slower in the mornings but the planned improvements on dom rd should make it better. Secondly, I assume you will be running feeder buses from places like Lynfield? Considering the minimal time gains, I think most bus riders would prefer to stay on the bus right through to downtown rather than go through the hassle of a transfer. Lastly, a large percentage of the bus riders on Dominion Rd are university students and for them the CRL is on the wrong the side of the CBD whereas the bus stop is perfectly placed on Symonds St. I would imagine that if given the option, they would rather take the bus than endure the walk up the hill. Yes, it’s a massive duplication of public transport funding. There are some good aspects to the wiring diagram on this blog, but this spur is illogical and debases the whole. I see no duplication. The buses and the trains take different routes. And currently Dom Rd buses are often too full pick up closer in riders so taking some long distance riders will greatly benefit bus users kilometres away from these stations. But also look at the CFN; it’s also about running patterns and network balance, we know there is much more demand on the inner west stations so this is a way to lift the frequency for that demand while also, cost effectively, extending the reach of the whole network. Post CRL this line will also lift frequency on the other side of its run which is likely to be the eastern line. So it is also great for those areas, especially for cross town trips, like Panmure, GI, or Orakei to Kingsland (Eden Park), or New Lynn, or Hendo…. The great benefit of the through routed Metro style system we propose, and is clearly the plan in that AT image above. Furthermore a capex investment like this is incredibly long lasting, a one off spend of endless value. How this could be considered a waste is hard to fathom. Like the Victorian ROWs in London this will still be being used in centuries. 150m needs to be understood in those terms: value. I caught a dom rd bus out from Symonds st at 8pm yesterday and it was so full I had to argue with the driver to be let on! It also took 29 mins just to get from Symonds to balmoral, I pity they people who were catching it to blockhouse bay. Its lucky this thing already has the designation and bridges in place. because otherwise, its hard to see it ever getting the go ahead as a spur that stops in mt Roskill and, for a decent part of its trip, heads away from its destinations. Its a shame that topography and geography prevents it from carrying on through as originally proposed. That would be a very convenient, and presumably popular, inner west-south link. It’s not that indirect. 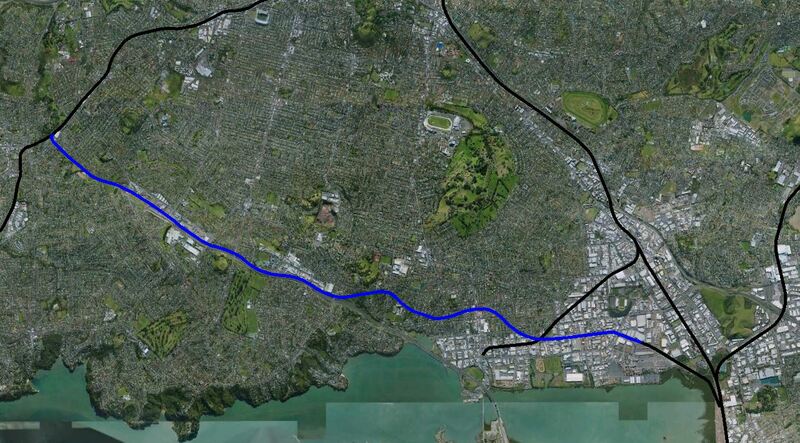 The dog-leg’s pretty close in length to Onehunga, and it’s much more direct than the Eastern Line. Plus, it’ll be brand new track in pretty much a straight line, so should get some decent speed. Doing a really rough route on Google Maps suggests that the line would be about 11km to Aotea, compared to about 8km by bus. Well that is promising, given the western line averages around 30km/h while the dominion rd bus does 15km/h. Western line average should hopefully go up a bit with the EMUs. The curvy, hilly and closely station spaced inner sections will probably benefit quite substantially thanks to the faster acceleration. Well the main advantages seem to be bringing the inner west closer to the city and taking the heat off some pretty popular bus routes to and from the CBD. So while I agree – and hope – passengers would use it for other destinations, it really is about the CBD when it comes to this particular piece of rail. Ok, first comment seemed like concern trolling, but that one sounds more like genuine concern. You may be right, but look at motorways – you often get on the motorway going out your way to do so, on the understanding the door-to-door trip time will be reduced. But it will only work if the trains are able to be faster and more efficient (even after transfers are allowed for) than the alternatives. This has fantastic potential especially if built as curve free as possible, but connecting with Onehunga rather than merely a spur. Queue a change of government though before this ever happens. The grade east from Hillsborough Rd is fine, if the designated route is used. It only becomes problematic if it stays near the motorway. Should Marsden Point get its rail link, the Southdown-Avondale Line will be essential, and it will need to be built to the designated route to be freight-friendly. The original proposal was for the new line to run from Southdown to Kumeu, via Te Atatu, so as to avoid all the steep grades on the current line. I disagree on your last point, that the designated route has no PT purposes east of Hillsborough road. I can see lots of options this route would enable. But it may leave the current Onehunga station a little high and dry. Building the line on the designated route would enable it to serve a greater PT purpose than the SH20 route, as it would enable a Hillsborough station in addition to all the stations that the SH20 route would have. But it would mean a second separate onehunga station, or not stopping at Onegunga at all. Yes ,that is correct, but how about this idea to put more “PT in the Onehunga mix”. [I came up with this idea this afternoon during a power-nap, so it may be half-baked, but it may not]. Run the Southdown freight line extension a few blocks – at grade – through to the existing Onehunga line as a a pair of (westbound/eastbound) lines. 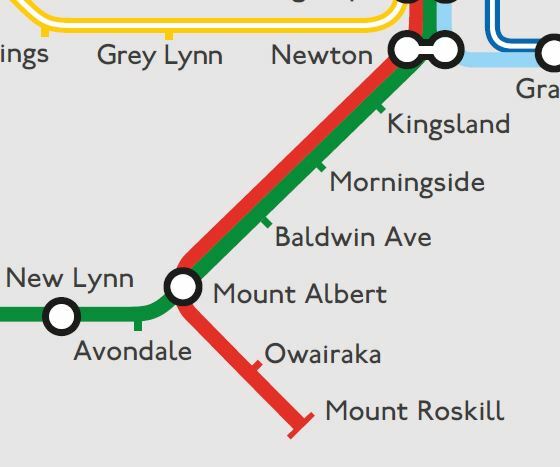 since it would merge at grade with the Onehunga line (at/near Captain Springs Reserve I think) that should be simple to do as its already designated right? Then with that in place you route some of the Northbound trains from further south (below Westfield Station) to Onehunga by this deviation, to pick up/drop off Onehunga passengers. Then carry on north to Penrose Station – now this adds some time to the Northbound trip, but the result is that it frees up the entire NIMT network south of the CBD for running more North/South Services instead of a mixture of North/South and “Onehunga only” trains. Going South from Newmarket some trains would do the reverse – hike out to Onehunga from Penrose then head out of Onehunga and south via the Southdown deviation. There are no stations between Westfield and Penrose on the NIMT, so nobody misses out if we route trains this way some of the time. And if you space the trains right, those who want to go direct to the CBD can do so (without being blocked by the Onehunga trains), and those who don’t care or who need to get to Onehunga can use the slower “via Onehunga West” trains. It would mean that folks in Onehunga who needed to go south could do so easily, it would improve the trains per hour on Onehunga (both ways). And mean people from the south who want to alight at/get to Onehunga can do so. Once those Onehunga trains reach Bitormart they could route through e.g. to Manukau like is planned now. An earlier idea I had Greg, was to build the Southdown-Onehunga line, and run trains between Britomart and Onehunga via both Newmarket and GI. In one way, out the other. Then you pick up all the industrial workers who live in the GI area and work in the Te Papapa area, and all those teenage girls doing the shopping rounds of Sylvia Park and Dressmart in Onehunga. If the airport line is ever built from Onehunga, you would then have all the eastern line stations linked to the airport services as well. Would require a fly over at Westfield Junction though, but there’s plenty of room there for one. Nick, a second station at Onehunga would be fine. Just like Newmarket having Grafton as well. Not quite the same, as Grafton trains also stop at Newmarket. It’s not an either or situation for getting to or from Newmarket. Currently there is no link possible between Onehunga and GI lines due to the track alignments and the way the GI line (westfield deviation) joins to the NIMT, without some kind of “go south towards Papakur for a bit, then come north via the Southdown-Onehunga line”. Not exactly ideal of efficient, and the driver needs to change ends on the train. I think if the existing Southdown link was extended to at least to the existing Onehunga line it would give a lot of flexibility with running patterns for the whole Onehung and parts south, for only a few tens of $m. Heck seems we’ll spend 10 times that on some fancy new motorway interchange, so this is chump change. Longer term, yes it looks like the Mt Roskill spur will become a through line. I can imagine the howls of outrage from all those Hillsborough and Onehunga residents impacted “who never thought the train would be put through their neighbourhood” – despite the designation for it existing for over 60 years. Freight is the only thing that nags at me about utilising light metro across the harbour. It would make for a very good deviation to the NAL and render any freight need for the Mt Roskill line redundant. Do you have any idea how far Albany is from the NAL? Have a look at Google Maps and draw a natural rail corridor to Kaipara Flats. Then you’ll see what I mean. We already have a northern freight line that is rotting through disuse, why do we need another? It’s not like those logs, containers and bulk aggregates are at all time sensitive. The other question is would we want to burden down the north shore line with freight, even if we did want to build it to full heavy rail standard and extend it an extra 40km to link up with the NAL. The freight would have to pass through tunnels and underground stations in the city centre, then the harbour tunnel, then the line up the shore. Sounds like a huge amount of extra expense to get freights rumbling through the core of the rapid transit system, limiting operations to around six trains an hour whenever you want to run freight. So it’s probably better to build the intended Southdown – Mt Roskill line using the freight alignment and upgrade the NAL? It means the line isn’t perfect for metro use but the trade off is a freight line away from downtown lines. I don’t know if we even need to do that. We don’t run freight at weekday peak times which I think is perfectly acceptable. However we will be able to slot in freights across the day and given them free reign late evenings and all night, even with all day frequencies around 6tph. The question is would we actually have to do anything for freight apart from a little operations management? As it is they run one return freight on the NAL each day, and a second each night. You could probably increase that tenfold and still only be running one an hour or so. The original purpose of the Avondale-Southdown Line was for freights to bypass Newmarket, and that need will get greater, not less. Then New Lynn becomes the problem…. Yes, New Lynn would become a problem, but much less than Newmarket: at New Lynn freight trains will either merge (up trains) or conflict (down trains) with one passenger route, whereas at Newmarket every train has to fit the service pattern of two routes, all of them merging and down trains conflicting too – and all then having to accelerate up a steep grade, not something freight trains do well. KiwiRail has kept the ASL designation for a very good reason! To not at least think of a future where rail freight on the NAL may become more important would be a mistake in my opinion. As silly as kin of future proofing bridges that aren’t future proofed at all. Well the reservation is there, don’t think anyone is suggesting its removal… But I don’t think there is any need to make the Mt Roskill spur or anything else contingent on doing the freight link, nor saying it is necessary before increasing freight on the NAL. I’m all for the spur. It has got to be great value for money. I was more thinking big picture, long term at the same time. 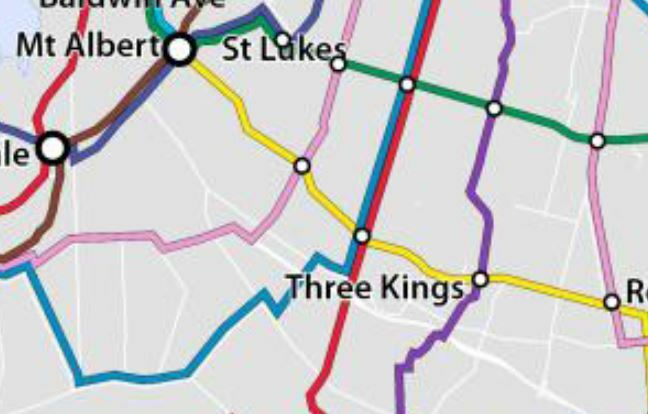 As a Three Kings resident, I remain bitter and twisted about the line not running the extra block, but putting that to one side….. I cannot see the Mt Roskill station attracting much patronage. The line is sandwiched between the motorway and the industrial, and increasingly big box retail of Stoddard Road. Much of the other land around that area is eaten up by multiple parks, two golf courses and the Mt Roskill schools campus. Plus as another writer has pointed out, the Roma Road industrial area appears to have been abandoned (but potentially could be re-used for housing). North of Mt Albert Road, you would probably take the Dom Road bus, particularly with its forthcoming right of way improvements, and CFN proposal for LR conversion. And if you’re south of Richardson Road, you’re probably already on the Dom Road bus, so wouldn’t be much point getting off it. However, I’ve taken the train from Onehunga a few times – also a 2 station spur, of which one station is in a mainly industrial area – and it’s surprisingly well patronised. A lot of the housing stock in that part of Mount Roskill through to Owairaka is state housing past is best in terms of design, and may prove an ideal opportunity for bulk removal and intensification around a new station area. Near my uni here in Wales is a station called Treforrest Estate. There is no housing, no schools/universities and only a few occupied industrial buildings but it is well patronised even though its not even close to the industrial estate so I see no reason for a Mt Roskill station suffering due to big box/industrial estate facilities nearby. We stopped it short as we feel going to Hayr/Hillsborough Rd might be a step too far and obviously more costly. Could certainly be a fairly easy extension option if this was successful. Also happy for it to be properly assessed as an option if we can get the line assessed. I’m definitely not opposed to taking it further. Catchments may suffer a bit due to severance, but perhaps they can be recovered and extended. I’d imagine a decent neighbourhood-level cycling network focused on train stations would achieve that, and it’d be relatively cheap to implement. Given reasonable bike parking at train stations, and higher service frequency and reliability, it could work better than nearby bus stops. People will be prepared to travel a longer last mile if the environment invites them to. Given that Alan Wood Reserve is already being partially consumed by the Waterview motorway connection, has consideration been given to the cost of cut-and-cover through the park instead of a surface connection? It’s a lower-socio-economic area, and the residents have been treated quite poorly in terms of the massive loss of neighbourhood green space to the roading monster. Taking more space away for a rail corridor, already designated or not, is adding insult to injury. What’s the point in cut and cover when there is the motorway to cross anyway. It would add hundreds of millions to the cost and kill the idea stone cold. Also I don’t agree with the argument that this is taking space away from the community, this was designated before any housing was nearby so should not have been counted as public open space to begin with. It’s also important not to judge open space by a pure size metric. A slightly smaller but higher quality open space can be far more valuable a larger but empty open space. BTW the local board and at least one councillor for the area have indicated they strongly support the idea. Um, Matt L, do you live in mt roskill? And no he doesn’t. He lives further out west and if anything he is potentially advocating for less frequency to his station on the western line by promoting this spur. Not all of us are only concerned with our own area. Very convincing argument, good job Matt. Do the track costs include double tracking the whole way (including two platform stations) with a scissors at Mt Roskill, and all wired up too? Seems a tad low. But as a scheme, I think it’s great. In terms of catchment, good cycling and car parking would help it be a railhead for the wider area. Even if on a given journey a train and bus take exactly the same amount of time, most people would still prefer to take a train over a bus. I assumed that the post CRL operating pattern would be two pendulum routes, for example Onehunga to CRL clockwise then Glen Innes/ Manukau, and west to CRL/ Newmarket/ Papakura. If Mt Roskill is added, where do the trains go after city? Surely a second pattern to Glen Innes won’t be needed? 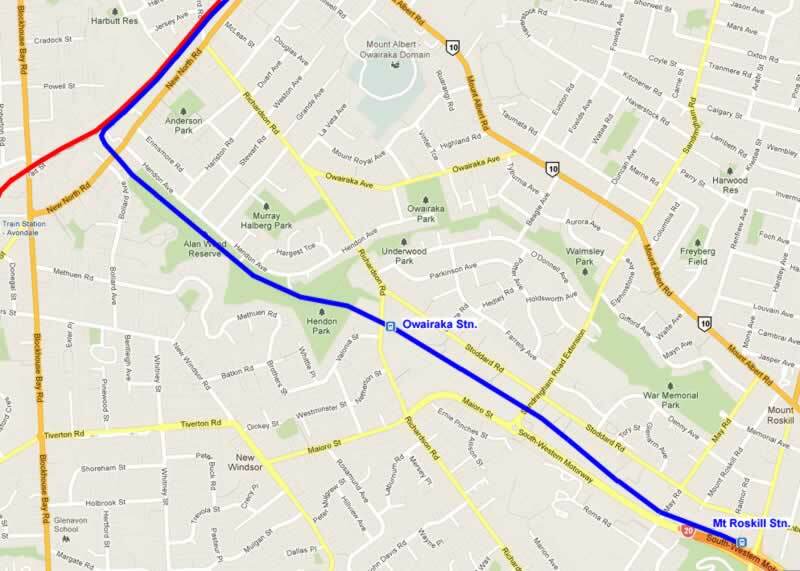 Roskill to Panmure is the plan on this blog I think…. Do we permanently abandon the freight from the North Auckland line? As one of the champions promoting this line I am delighted with the debate taking place. A great way of bringing the issues to the fore. Well done Matt I hope people like Len Brown will be reading your well written lead article all about this proposal. My belief in the patronage on the Onehunga Line wasn’t mistaken and my gut feeling for this line is the same. Having campaigned across Roskill I know the support is there and with the new trains soon to be appearing on the tracks who wouldn’t want to be using them instead of buses. Also the much easier cross city travel opportunity, in conjunction with the HOP card, which it will provide for our local residents must be a huge attraction. Too often we assume Britomart is the only place people want to go to. Obviously there are pros and cons of each, and in an ideal world we would do both now, but we don’t live in an ideal world. Also I don’t know which would cost more. I think the lack of central stations with the shore line option could be partially fixed by putting trams from Britomart up Queen street and Dominion road (and not building the Roskill spur). Again I don’t know how much that would cost and it would be no where near as handy as central train stations would be, but again we don’t live in a perfect world. Maybe could also do a spur from Britomart to Wellesly street – as I understand it that is the cheap part of the CRL? By the way I don’t live on the shore! Jimbo, on the surface that sounds like a reasonable idea but it is definitely the wrong way round to do things. The number one issue is that an extension from Britomart to the North Shore doesn’t actually stop Britomart being a dead end bottleneck, not for the current network at least. You may be able to run a whole lot of trains through to the shore and vice versa, but for the Western, Eastern, Southern and Onehunga lines you still have the same limit of 20 trains an hour into Britomart through the existing throat tunnel. You’d have the strange situation where the Shore line would be able to move as many trains as the other four lines put together. The CRL really works wonders by the fact that it links back to the existing network, which doubles the capacity (more or less) across the whole network. So a Northern extension from Britomart really only provides for a north shore line with no change anywhere else, while the CRL adds three new city stations, doubles the frequency everywhere and allows lines to run through from one side to the other, i.e. it basically creates a metro system for everywhere but the shore. The other issue is one of timing and prioritisation. The busway is doing very well and has potential left in it yet, the need for a North Shore line is probably a couple of decades away. The only reason I could see for doing it earlier would be to avoid building a motorway tunnel (building a cheaper rail tunnel we don’t need yet instead of a very expensive motorway tunnel we may never need is definitely the lesser of two evils). As for the potential users, well we are no way near capturing all the potential users of the existing rail network. Patronage could grow tenfold before that was an issue, so it makes sense to spend the money on a project that benefits 3/4 of Auckland before the 1/4 that lives on the North Shore, and of course they still have the new busway which works great at the moment. Oh, and by the way I am Shore born and raised! Hang on, i thought the extra capacity at Britomart with the CRL was all about trains not having to stop and reverse out. If the trains go straight through instead of in and out then that’s half the movements, as well as not needing dwell time to change ends on a limited number of platforms. Why does it matter where the other end goes? A Southern line train going straight through to the North is a train that doesn’t need to stop and reverse out just as much as a Southern line train going straight through and out West. So if the west, east, and southern lines all carried on up to a new terminus at Albany, wouldn’t you have doubled the capacity of Britomart and allowed lines to run through from one side to the other? Though personally for me it would be amazing to get one train from where i live on the western to where i work on the busway, you probably wouldn’t want to run all the trains up North. Perhaps you would have the western line come into britomart, turn around and head out east, while only the southern went up north, or have each Southern and Eastern train alternate between west and north. You wouldn’t double the capacity then, but you would increase it by 50% while adding a whole lot more catchment. That 50% capcity should suffice until the CRL is built as the next project. This way the project benefits that 4/4 of Auckland that lives east, west, north and south. I suspect the thing that would kill this is the cost. What is the cost of a new rail line on the shore plus the tunnelling under the Harbour? You are right, there are many advantages to this configuration. But we miss the access the CRL provides to the city centre (don’t confuse residential and employment catchment with geographic catchment). We also miss that the number of trains coming in from the East West and South can actually triple with the CRL, as every train going through the CRL will come from, and go to one of these locations. The biggest issue thouh is cost. Probably 5b to do rail to Albany as heavy rail. Not really Dan, it’s still the same amount of movements on the city side. Twenty in the existing Britomart tunnel and twenty out again, means twenty trains an hour across the existing network, exactly the same as today (At five, the number of platforms isn’t actually a constraint, the turnaround time is a fairly leisurely fifteen minutes per platform at the capacity of the signalling on the tunnel approaches). Yes you could double the capacity of Britomart that way, but only Britomart and only in terms of adding trains to and from the North Shore. If you ran twenty trains in from the North Shore through to twenty trains from the existing network, and vice versa, you would have forty an hour. But still only twenty across the existing four lines, so you still only have 6+6+6+2 at maximum on the eixsting lines. It matters where the other end goes, if the other end goes to some of the existing lines. Then those lines are using the two tracks in and out of the new end of the tunnel and they are no longer on the existing end. The key difference is a southern line train going through the tunnel and out west from Newton is a western line train that no longer runs out from the Britomart side, and vice versa. A western line train coming in at Newton is a western line train that no longer runs in to Britomart from Quay park. Put it this way, if you put the western and onehunga lines in and out the Mt Eden end then they aren’t running in and out the Quay Park end. Only the southern and eastern are, so you can double the frequency on all of them. If you extend Britomart to the Shore instead there is no opportunity to shift those two lines, you still have four lines running in and out of Britomart from Quay Park. Nah the turnaround capacity at Britomart isn’t a constraint so there is nothing to be gained by relieving it. You couldn’t get 30tph through the flat junction at Quay Park, 30tphpd is the theoretical capacity of the CRL on a network without any junctions but we won’t see that in practice, especially not with four lines meeting atquayy park. Also you couldn’t put 8+8+6 through Newmarket, especially it if the western line were still doubling back in and out of the station. That would be sixty movements an hour over the junction. How does the OP feel about Labour’s bringing forward the start of the light rail network being from Britomart to Mt Roskill (and then Auckland airport), with respect to the Mt Roskill Spur? Now that AT has in no uncertain terms canned the idea of a proper (heavy) rail link from Auckland airport to the city, does Labour’s energy on the start-up of this network hold even more importance?